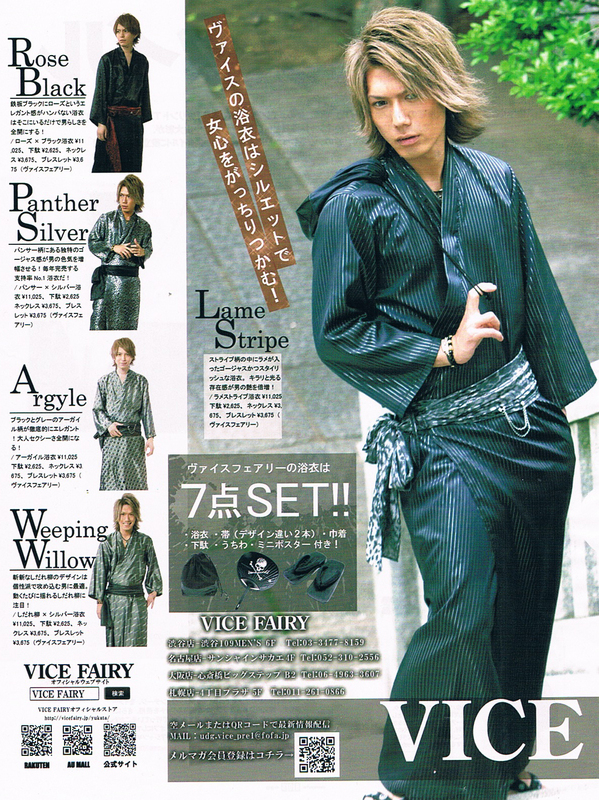 From the good folks at Vice Fairy, summer yukatas for stylin’ dudes! If old-fashioned cotton yukatas printed in manly designs dating from great-great-grandpa’s day just don’t say, “romantic fireworks date” to you, now you can choose from four styles of traditional wear rendered in fabric as shiny as the most fashionable host’s suit! Accessorized with a skull-emblazoned fan, black geta and wallet bag, you’ll radiate coolness on even the hottest summer night. And don’t forget to add a little bling to your obi with your favorite rhinestone-and-chains lapel pin!